Last week, a group of smart grid and consumer electronics heavyweights, the Consumer Electronics Association (CEA) and the Electric Power Research Institute (EPRI), quietly announced a new standard that could, someday, make the term “smart appliance” obsolete -- by making every appliance smart grid-ready. The standard, CEA-2045, is pretty simple. All it does is define a "modular communications interface" or MCI, kind of like a USB port standard, only for appliances -- specifically, water heaters, air conditioning units, pool pumps, and electric vehicle chargers. Those are the four types of appliances being built right now by unnamed companies, in preparation for trials of the new standard with unannounced utilities this year, Brian Seal, EPRI technical executive, said Monday. But unlike the smart appliances we've seen piloted by utilities and rolled out at trade shows like CES year after year, these new CEA 2045-compliant appliances are being built in a way that should lead seamlessly to mass manufacturing, Seal said. That means that participating companies are investing in everything from the tooling, plastic molding and sheet metal fabrication to build these MCI ports into every appliance, to the UL certifications and other key validations needed to move the MCI-equipped appliances into commercial and retail markets, he said. “I believe you’re likely to look back in five years and say, this was a turning point -- a very basic, simple thing that turned the corner for demand response,” Seal said. Of course, it’s taken a long time to get to this point -- EPRI, CEA and the USNAP Alliance, an industry group that’s been championing modular comms for years now, started work on what's become the 2045 standard back in 2011 -- and there’s a long way yet to go. So what does CEA-2045 do that’s so groundbreaking? In technical terms, the new standard seems simple indeed. CEA’s report (PDF) says the standard “details the mechanical, electrical, and logical characteristics of a socket interface that allows communication devices,” which the paper calls universal communication modules, or UCMs, “to be separated from end devices” such as smart meters, communications nodes and other smart grid devices -- i.e., to link UCMs via various networks to the smart grid. The MCI protocol uses the RS-485 and Serial Peripheral Interface (SPI) supported by most silicon chips today, and can pass standard protocols including Internet Protocol (IP), OpenADR, and Smart Energy Profile from the communications module to the end-device. Network security is provided through transport protocols such as Wi-Fi, ZigBee, HomePlug, Z-Wave, LonWorks, etc. Which communications technology you use depends on which utility program or home energy platform you’ve chosen, of course. But because the appliances simply provide the port for the comms module to plug into, a homeowner or installer can switch one comms module (UCM) out for any other with ease, Seal said. Choosing water heaters, AC units and pool pumps wasn’t an accident, Seal added. Those devices should be contrasted to appliances like refrigerators, ovens, washer-dryers and other stuff that homeowners interact with frequently, and have been the main focus of smart appliances initiatives by the likes of LG, Samsung, General Electric, Whirlpool, and others. Water heaters, pool pumps and central AC systems, on the other hand, are out of sight, out of mind for most homeowners, Seal said -- until they break down. At that point, a homeowner's chief, and often only, concern is to get the thing replaced as soon as possible, which means he or she isn’t likely to ask a lot of questions about whether it includes networking or communications abilities, he said. Even if they did, there’s no market for manufacturers, retailers or installers to promote smart connectivity. 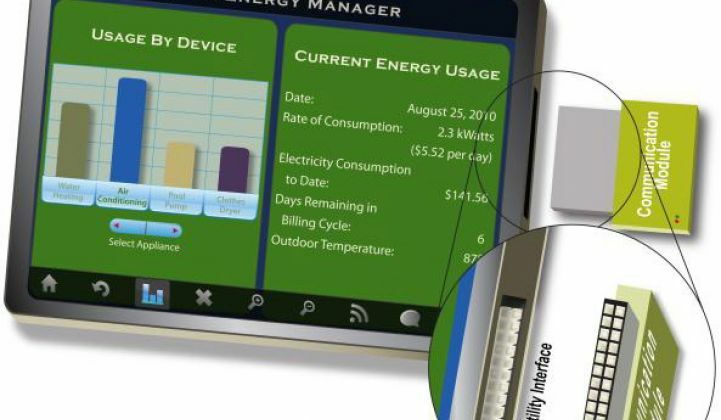 It’s just too expensive, not only in the today’s costs of $50-and-up for retrofitting or custom-building connectivity into devices, but in the cost and complexity of installation. Even the simple load-control, on-off switches deployed in the millions in residential and commercial demand response programs around the country require specialized installation by an electrician, Seal noted. “All these things together make a modular approach really sensible,” he said. “It means that at a very, very small upfront cost, products can have the potential for becoming connected and becoming enrolled in these programs” -- even, he said, “if this connectedness doesn't come into place for decades.” After all, he said appliances like water heaters and central AC are supposed to last twenty to 30 years, a period in which we can expect communications technologies to undergo wholesale changes several times over, if the past is any guide. Think of it this way: if every water heater and AC unit comes with an MCI built in, the extra cost is now shared across the industry, meaning that nobody loses competitive advantage as a result of investing in it. That leaves the challenge of actually connecting and managing these new demand-response assets up to the utilities, communications module makers and software and systems providers involved -- but at least they’ll have the embedded base of real energy-using appliances to tap into. As for which vendors will provide that critical communications and IT link, the USNAP Alliance members page lists some contenders, including GE, Itron, Sensus, Trilliant, Radio Thermostat, Comverge, Aztech, GridGlo and Intwine, to name a few. One could imagine Digi International, a big behind-the-scenes provider of wireless network connectivity and management for smart grid-to-home technologies, also playing a part, as well as appliance makers that are already connecting their devices to some extent, such as GE, Honeywell, Emerson and the like. EPRI’s upcoming trials plan to roll out appliances to utilities using different communications modules and networks, as well as different signal and command capabilities, he said. It’s likely that OpenADR, the emerging standard for automating demand response communications, and Smart Energy Profile, the emerging standard for controlling home energy, will play a role in those projects. The trial will also evaluate various business models for utilities interested in boosting the proposition for manufacturers, installers or retailers via incentives or other means, he said. “Our utility partners are on-board with the idea, and ready to create the necessary incentives to make them whole, so to speak,” he said. That’s important, because it’s utilities that stand to reap the greatest reward from the proliferation of smart-grid-ready appliances in their customers’ homes and businesses. Most utility customers simply don’t spend enough on electricity to care about shaving use during peak hours, or adjusting settings to take advantage of cheap, off-peak nighttime power, to name a few functions that smart grid-ready devices could provide. But utilities can use hundreds of thousands of networked ACs or water heaters as enormous demand-side resources, to tap to prevent blackouts or to build into their future planning to avoid building or buying new peak power generation or transmission and distribution grid upgrades -- and that’s real money. Just how much utilities are willing to spend to speed up the natural replacement rate of water heaters, air conditioners and other key appliances to take advantage of its potential, is another question. No doubt the wealth of data from smart appliance and next-generation demand response pilot projects around the world will help in calculating some reasonable figures. Adding the benefits of a modular approach should yield even more cost efficiencies and benefits of scale. Just how much, we’ll have to wait for results from EPRI’s upcoming trials to find out.